Neem is one of the oldest documented plants on the planet and has been used consistently for it's soothing properties. 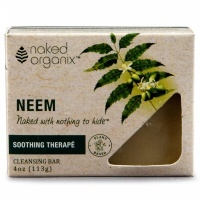 Naked Organix Neem Cleansing Bar offers a concentrated plant-based formula to protect, repair and moisturize face and body. Neem is rich in anti-oxidants and nourishing EFA's (Essential fatty Acids), making it a gentle yet effective moisturiser for sensitive or dry skin. Hand crafted in small batches containing only the finest quality organic & wild-crafted ingredients. Scent free, chemical free forumla for sensitive people.